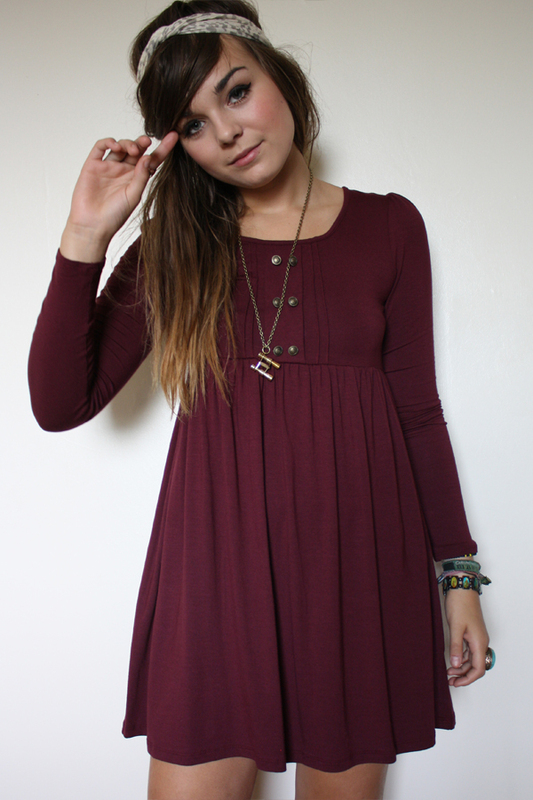 I saw this lovely mullberry colored dress today and I knew I had to have it! There is something I really like about purple, Maybe its just because the autumn is coming. I desperately wanted to wear it with my leopard print scarf, as I see leopard and fall colours mixing so well together! But I couldn't find it, So opted for the leopard print headband instead! Its been a while since leopard has been on the blog? I tried this dress on and it was super long, put it back and then ended up picking it up again on the way round and it was miles shorter than the other one I tried on! Gotta love the Primark inconsistencies! Mum was being generous today so bought me a load of Primark stuff. Mainly due to the fact tons of the stuff I wanted was in the sale. Most of the dresses were around £5 and the tops were £3. I didn't have much time to have a proper look around as Ivor was being moody as he hates shopping! But if you live near a big Primark store, or even a small one with good stock, Its totally worth checking out the sale! So much of the stuff is reduced! I blame the over inflated Primark prices at the moment, £15 for a PRIMARK dress? No thanks! The prices have gone up but the quality hasn't! Yes the dresses they are coming out with at the moment are really lovely and tasteful, But the quality really isn't reflected in the pricing! Uploaded a little test video to my Youtube channel! I used my new camera, Although its not supposed to be a proper camcorder, there is a little hack to make it be usable for recording videos. It doesn't have a microphone, I have to record the sound via my Macbook microphone and then sync the audio manually, Seeing as I've never done this before it isnt perfectly synced but Im sure I'll figure it out properly soon! I have the same camera!! But I haven't figured out how to do videos? Could you help me?! Please! I love the whole outfit but £15 is a lot for that dress, I still want it though hehe. loooking cute as always :) love the necklace! i adore the colour of this dress! My friend bought this dress today, I really like the colour of it. It goes great with your cardigan and scarf too! aaww.. this dress is cute! i really like how you combined colours and print. looks really good! btw i really like your blog! it's very inspiring. i havent been in primark for awhile. must go soon. I love that dress, it's gorgeous! I really need to get down to my local primark as soon as i'm paid! BEAutiful! I'm having a Primark spree quite soon, I think. Will totally keep an eye out for that beautiful dress! you look beautiful, as always. i planned to go primark tomorrow so i'll be on the lookout for this. i'm just loving plum colours at the moment. That's such a lovely autumny dress! I've never bought anything in that colour because my primary school uniform was a maroon/mulberry colour haha, but this is tempting me. Love the headscarf as well, it really updates the whole look. You are officially cute as a button. The colors are gorgeous. I love the color of the dress especially. :) Oh and the binocular necklace is so cute. The dress is from primark!? Its absolutely stunning! Why do I never find great finds like that and all the other bloggers do! I love it when Mothers spoil us! Beautiful outfit and lovely post! (: Love love love the dress! Ahh I need that dress! Love your blog & that dress. I would love for you to follow me!! Mulberry is a beautiful color on you! talk about the most perfect dress in the world. Great dress and it's totally adorable on you! I love the color and cut so much! your are definitely my primark icon- i had ever bought a single thing from there until i found your blog a few months ago and now i always have a look when i'm shopping. again you look amazing here, i love you paired the purple and green and also think the leopard print scarf would look great! lily - this is your best look in a while ( not that your others are not good ) but that colour really makes your complexion pop and your hair colour look really deep & rich. This may be my favorite look from you EVER. The colors are absolutely delicious and you are gorgeous as hell, lady. I love that dress so much - i tried it on in the khaki green colour and mushroom but i just looked awful in it! you look lovely though! I would never think khaki + mulberry colour can look so good together! gorgeous. Simple, but still really chic. i love that outfit! the grape color is fantastic with that green! Maybe with natural hair waves it could get more romantic! In my last post i made a tutorial to have a romantic hairstyle, maybe it´s useful for you, check out! Ok, thank god I'm going to London where there is a Primark, because I NEED that dress! I'm liking the colour combo. Nice dress! You look fantastic! I love the color of the dress & the color of the cardigan together. love the mulberry with the forest green...and yes the leapord is a lovely touch to the fall colors. Outfit looks great! !